make it perfect: .Let the building begin!!!. Well, it has FINNAAALLLY started...our house is underway! It has been a process getting this far...waiting for the bank, council, water connections, etc. THEN to top it all off Jaron found out last week that his office is closing and he will soon have to travel over an hour to get to work rather than 45 minutes. I know that in the cities one hour+ is a usual amount of time to travel, but here in Tassie, it is pretty much unheard of. Anyway, our options were to forgo building the house (and lose a fair bit of money) or go ahead with it and put up with the extra travel time. If we don't build now then it is going to be a long, long time until we have the opportunity to do it again so we have decided to stick with it and hope that another job closer to home pops up in the meantime. 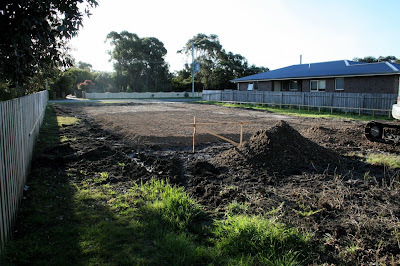 So, this is the block now...foundations should be finished by the end of the week. It is exciting and scary all at the same time. Especially that "m" word. Yuck! But will be WAY better than renting! And, for those of you who have been asking for a look...here is our floorplan (give it a click and you can see it bigger). We are on a very strict budget so it comes in handy having an architect-husband! 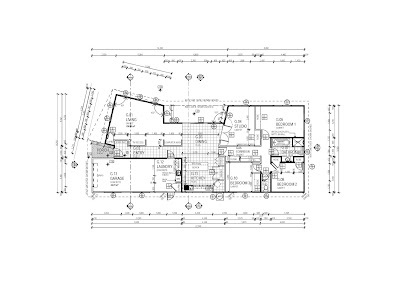 He can take care of the lay-out and house design (and give us a 7-Star Energy Rating!) and I'll handle the decorating ;) Got some fun ideas up my sleeves...stay tuned! Wow that does look nice. I like the tv recess and the computer nook great ideas and the kitchen as the center of the home. Will you have much land left or does it fill the block? aahh...the plans. so exciting...i love homey housey stuff. there's lots i want to do with ours- pity it requires HEAPS of (unavailable) moola! How exciting. The plans look great! Yeah, how exciting for you all!!! I have to agree the plans look great. Plans look great.... what an exciting time for you all. Fantastic! Great plans and an opportunity too good to miss.